Anise is responsible for much of the "liquorice" flavouring in baked goods, liqueurs, teas and chewing gum. 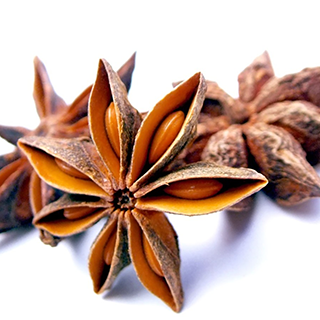 Chinese star anise and aniseed myrtle, although unrelated to anise have similar flavour. Anise is an aromatic stimulant to digestion and an effective carminative to help to relieve gas associated with indigestion. The herb is also used to treat dry cough, infant colic and hiccup and also promotes the production of milk in nursing mothers. Grind up to 1 teaspoon (2g) ripe anise seeds to release the essential oil before infusing them in boiling water. Drink up to 3 cups per day for indigestion and to relieve fullness and bloating. 3.5-7g as tincture, 5 to 6 times a day. The fruits of this plant are harvested in summer before fully mature. The plant is hung in a shady place to dry. Once dry, it is beaten to make the fruit fall. These are dried in the shade and stored in clean and sealed containers, in a dry and shaded place. Seeds harvested at maturity and dried.